This Saturday — on the eve of Palm Sunday — the Marionettes’ three choirs (adult, youth, and children) sing for hope, for healing, and to raise funds for the ongoing restoration of the historic Cathedral of the Immaculate Conception. Hosted by His Grace, Archbishop Joseph Harris, “Heal Our Land” promises an evening of musical upliftment, featuring a wide-ranging repertoire of beautiful music that will make your spirit soar — including the cherished Fauré “Requiem”. 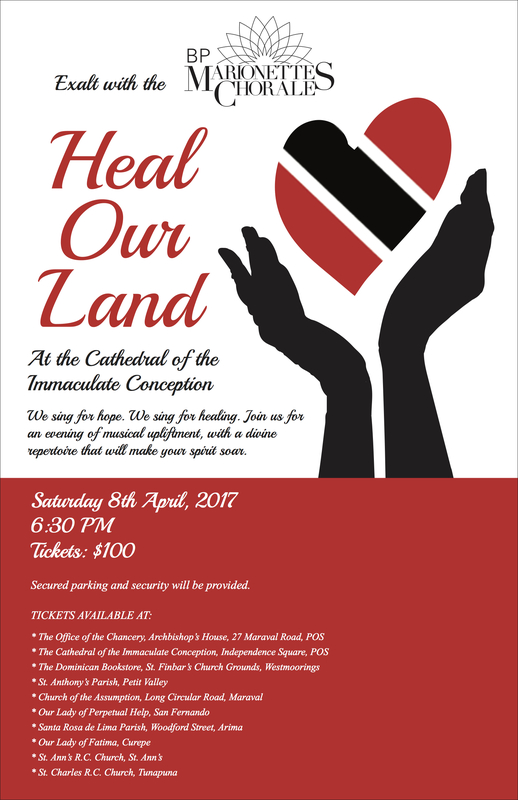 “Heal Our Land” takes place — for one evening only — at the Cathedral on Saturday 8th April at 6:30pm. Secured parking and security will be provided. • St. Charles R.C. Church, Tunapuna.